Following up on the online launch of the PCD TXTM8 last week, corporate parent Leap Wireless has announced the retail launch of the messaging phone. 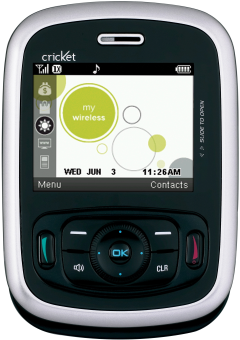 The TXTM8 feature set is identical to the Blitz with a 2.2 inch display, QWERTY keyboard, 1.3 megapixel camera, microSDHC expansion slot, Bluetooth with stereo audio support, and speakerphone with Cricket’s MyHomeScreen which provides access to news, sports, entertainment and weather. The phone is available for $159.99 before applicable sales taxes.